In the childcare center where I worked, it never failed to surprise parents just how independent their babies and toddlers were away from home. While they still spoon-fed their little ones in high chairs, at "school," their kiddos sat in little chairs at little tables, ate off of plates, drank from open cups and used utensils. They slept on cots or mats, took their shoes off before naptime, and washed their hands before meals. Your little one will always be "your baby," but an important step in her development is gaining a sense of independence. This can start VERY early on by letting your child participate in and help with everyday tasks. Here are some simple tips, tricks and ideas for letting your baby or toddler help in many little ways, every single day. From a psychological perspective, developing independence promotes self-confidence and self-efficacy - a sense of "I can do it!" It also shows your child that you are trusting of and confident in her. From a behavioral perspective, letting your young child do things every day for herself and be an active participant in her daily life reduces the inevitable power struggles of toddlerhood. She will push for independence and assert it (in dramatic toddler ways) as a natural part of her developmental phase and many (MANY) parenting experts agree that giving your child a sense of independence, autonomy and control when possible reduces problematic behaviors. From a language development perspective, engaging your child in every day tasks gives you SO much to talk about! Plus, the fact that daily tasks happen...well, daily means that new language gets repeated and solidified. Don't forget to ask questions and let your baby or toddler answer with her expressions, gestures or words. Asking things like, "It's time to brush your teeth. What do we need to brush your teeth?" while standing at the bathroom sink might elicit a response in the direction of her toothbrush - awesome receptive language development! From a sensory motor development perspective, allowing your little one to help affords rich experiences to develop new motor skills, strength and coordination for every day life. It also provides valuable new sensory processing experiences that will be parts of her every day life as she gets older - things like learning how much force she needs to open a container ("pressure and stretch sense" or propriceptive sense), feeling a wet soggy sponge in her hands as she wipes the table ("touch" or tactile sense), balancing as she bends down to pick up her shoes ("movement" or vestibular sense and proprioceptive senses). From a practical parenting perspective, it keeps your little one busy and makes the mundane tasks of every day life a little more fun. Have to make breakfast and your toddler is underfoot, whining or shredding the newspaper she pulled off the counter? Pull up a stool and let her help you crack eggs and stir them. It won't save you time, but it might just save your sanity before 9 a.m.
A Sturdy Step-Stool: A sturdy step stool (with very close supervision) is important for getting your young child to counter-height. My favorite option for babies (who can stand steadily) and toddlers is a very sturdy stool with sides or rails (sometimes called a "learning tower") like the Growing Step Stool. A more affordable option is the IKEA Bekvam Step Stool, which is unique in that it is over 19" tall. Most step stools for kids aren't actually tall enough to bring a baby or young toddler to counter height so be sure to note height when shopping. Time: Not to be overlooked is the fact that baby and toddler "help" is usually not actually helpful in the short-term. Do I let my 14 month old help wash dishes every time I do it? No way! But once or twice a week, I'll invite him to join or now he'll ask to help and I'll oblige. It takes more time to let your child actively participate in her care and in daily household tasks. In an ideal world, we'd be able to clear our schedules and slow down the pace of life a bit during the season of parenting young children and many parenting experts agree that this would benefit our kids' levels of stress and anxiety. But if that's not an option for you, pick times of the day or week when you can spend an extra few minutes letting your kiddo help. Patience Presence: If you ask your young toddler to take off his shoes while you turn your back to put down the diaper bag, odds are that he will be playing in the dog's water bowl with shoes still on when you look back at him. At least, that's what happens daily in our house! In all seriousness, babies and toddlers are developing their independence - they aren't independent yet. When involving them in a task, it is essential that you remain close and attentive (cell phone down) so that you can offer assistance, modeling and encouragement if needed. A simple way to let your little one help is for you to start a task or a part of a task and let them them complete the next or final step. This is most often the approach I use when I teach children to feed themselves. Examples: opening the top of a banana and separating part of the peel then letting your baby pull each section down; pulling your child's arms out of sleeves then letting her pull it off of her head; loosening your baby's shoes and slipping them off her heels then letting her pull them off. This is a great approach for clean-up and self-care tasks that ultimately have to be done thoroughly. Examples: letting your little one try to brush her teeth then you follow-up; allowing your little one to wipe her table or tray after meals. This approach is great for very challenging tasks or tasks that require hands-on assistance for safety. Examples: cracking eggs into a bowl at breakfast, cutting soft foods with a child's knife, washing dishes, pouring water on the head to rinse off at bathtime. Try this method for tasks that are require only basic skills. Examples: putting dirty clothes in a basket or hamper, pulling a hat off, or carrying a very lightweight bag of non-breakable groceries. The simple act of letting your baby or toddler make choices is a great way to encourage early independence. Examples: letting your child choose between two shirts, two snacks or two toys by looking, reaching, pointing or using her words. How Early Can I Start Promoting Indendence? From day one of life, you can involve your baby in her care by talking her through what you're doing to her and around her. It's tempting to put a mobile above her changing table and hustle through diaper changes and there's nothing wrong with that some of the time. But by making an effort to slow down and talk to her - "Now let's wipe your bottom. Is that wipe cold? Let's put your fresh diaper on. You're all clean and dry - doesn't that feel nice?" - you engage her in her care and lay the foundation for involving her in it in a few months. Here's a great post about respectful diaper changing from Janet Lansbury. Your baby can be an active participant in her everyday care once she can reach and grasp. At 4-6 months of age, most babies "find their feet" and it's a perfect time to start letting your little one help pull socks off. Once your baby can grasp, she can try pulling wipes from the container. I strongly recommend parents encourage self-feeding at every meal from the very first introduction of solids. 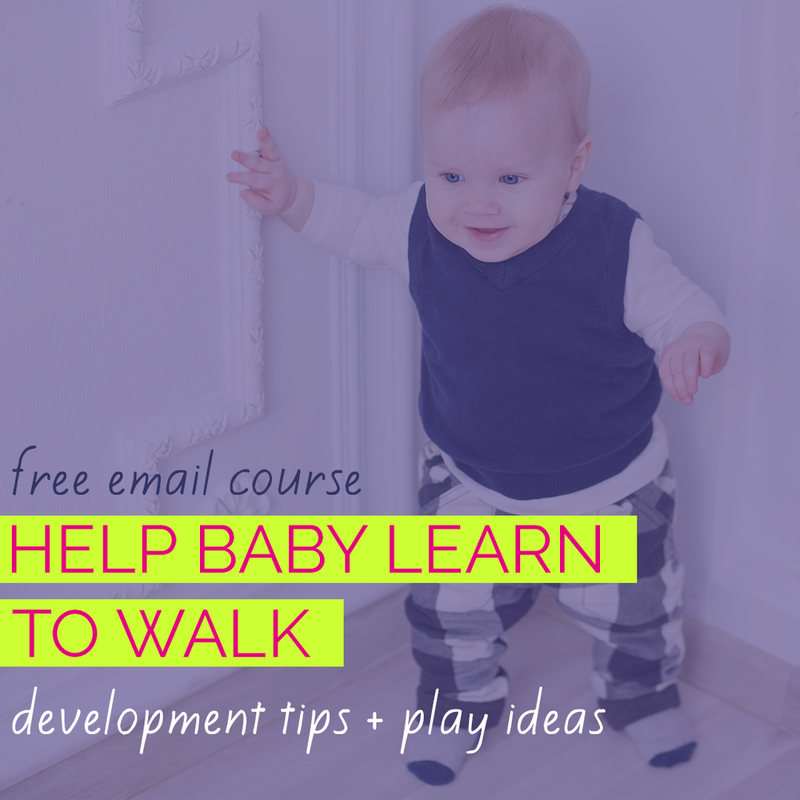 Once your baby is walking, a whole new world of helping opens up! 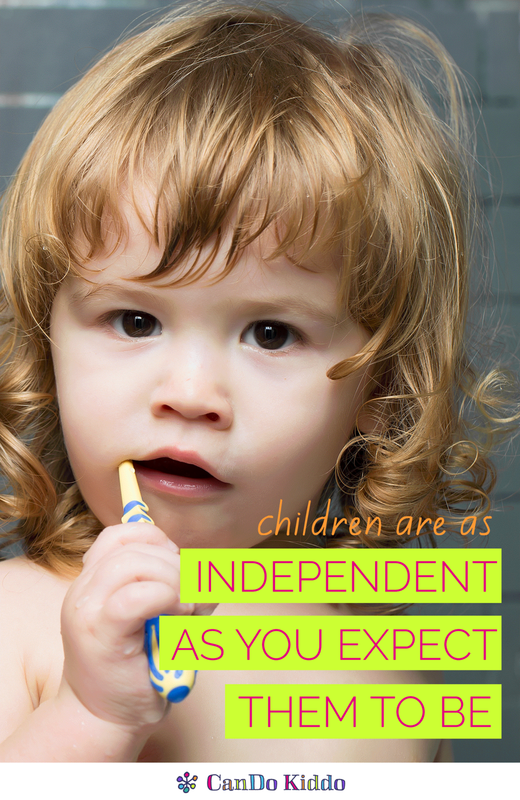 Encouraging independence starts early - earlier than most parents realize is even possible. Allow your kiddo to help, fellow parents, and prepare to be blown away when your itty bitty baby shows you what she CAN DO! Want more resources for encouraging toddler play? 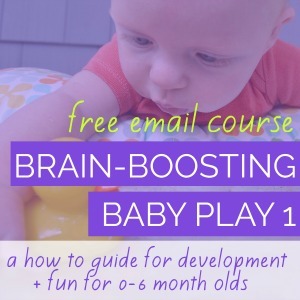 Using my professional knowledge of toddler development plus my experience as a mom, I created a free video lesson sharing my 3 top tips (plus a bonus!) for increasing independent play in toddlers. Get access to the lesson here or click the image below.